Thread Lifts | What’s all the fuss about? 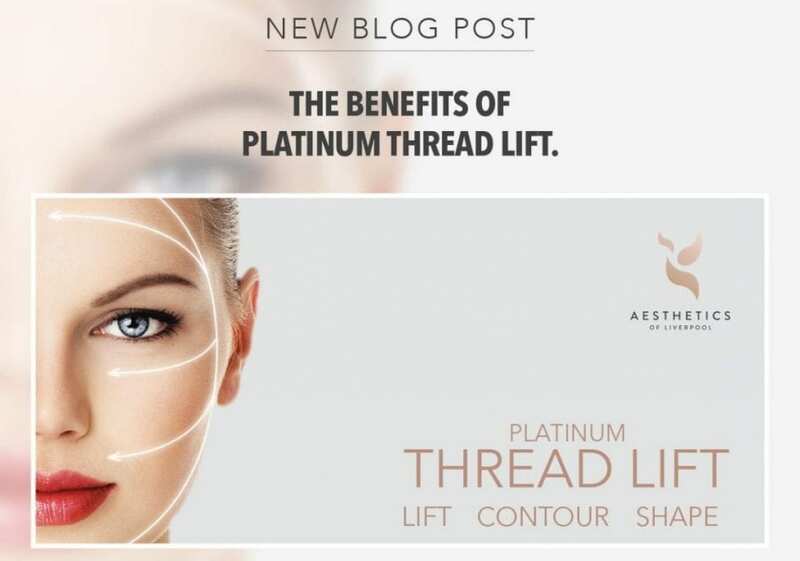 What exactly is a Thread Lift? Thread lift treatment is an increasingly popular cosmetic treatment which targets sagging skin encouraging a more youthful, vibrant and tightened appearance to the skin. Thread lift has earned its nickname as ‘The Lunchtime Facelift’ as it is a relatively simple procedure that can take as little as one hour and the downtime is extremely minimal, especially when compared with a surgical facelift. The Platinum Thread Lift uses specialised surgical threads to lift unwanted sagging skin. The threads are made from a naturally occurring substance that has been used in medicine for over 25 years. These threads are strategically placed along the contours of the face and gradually anchor themselves to your tissue, stimulating natural collagen production and enhancing skin’s elasticity and smoothness. When your body naturally produces new skin cells, these surround the threads giving an impressive lift to the skin while keeping a subtle, natural appearance. The results of a Thread Lift can take years off your appearance by dramatically reducing wrinkles and lines and lifting and tightening sagging skin. There are so many benefits to a Platinum Thread Lift, and it is easy to see why this procedure is becoming increasingly popular. To help make this treatment more easily understood, we’ve highlighted three of the main benefits of undergoing a Platinum Thread Lift procedure. One of the most significant plus points for a Thread lift has got to be that it provides beneficial, lasting results without the need to undergo invasive surgery. Not only is it a much cheaper option than surgery but it still makes an instantly noticeable difference in signs of ageing and sagging skin. While the results may not be as permanent as results from surgery; many doctors report that results from Thread Lifts can last anywhere from 18 months to three years. Surgical complications with a traditional facelift can be challenging to manage and involve a considerable time commitment in the recovery process. Not to mention, recovering from surgery can be very painful. With a Platinum Thread Lift usually, your day to day activities can resume immediately. Alongside this, the operation comes with many risks even just the risks associated with under general anaesthesia. Whilst, of course, every aesthetic procedure carries potential risks, a Thread Lift provided by skilled practitioners comes with minimal risk and is an extremely comfortable procedure. If you are put off by traditional surgery or simply don’t want general anaesthetic, then a Platinum Thread Lift may be the ideal solution as it is minimally invasive and can be carried out exceptionally comfortably at Aesthetics of Liverpool. As mentioned above, a Thread Lift boosts your skin’s natural ability to produce collagen to reverse the effects of ageing. Collagen is one of the structures that work to keep your skin tight, and it makes up about 80% of the underlayer of your skin (known as the dermis). Collagen helps to keep your skin firm and youthful looking. As we get older, collagen starts to break down naturally, and this means the skin loses its toned, youthful appearance. Platinum Thread lifts stimulate the natural production of collagen which says it helps to boost your body’s natural ability to repair and heal itself. More collagen production means that your skin will look more radiant and bouncy and the unwanted effects of ageing can be dramatically reversed after this procedure. As it is minimally invasive, scarring will not be a problem with this procedure. The procedure is most effective on skin that presents as volume loss, whether that be early signs of ageing and offers the best results for cheeks, jowls, chin, brows and the neck area. If you are looking for results that are more effective and longer lasting than Botox and fillers, or wish to combine them for enhanced results, then the Platinum Thread Lift is the ideal choice. Results can last for as long as three years meaning that your skin looks healthy and more youthful in between treatments. What else should I know about the procedure? A Platinum Thread Lifts lasting power depends on the age of the patient at the time of the procedure and how much volume loss is presented as well as the overall condition of the skin. As natural ageing doesn’t stop and loss of volume may start to return over time, it is possible to have additional threads inserted at specific points and results can also be extended by carrying out other aesthetic procedures such as microneedling, medical grade peels or laser, and your clinician can advise you when this is required. After the procedure, we will provide you with aftercare instructions to follow. Some clients experience some mild bruising, but this should settle very quickly. Usually, your day to day activity can resume immediately.